Let all your stress and worries melt away as you arrive at Villa Eriu, a home away from home that promotes endless relaxation. The waves lapping on the beach in the distance, the sea breeze brushing through the lush greenery that surrounds the property and the sunlight glistening on your private pool - welcome to a blissful paradise. 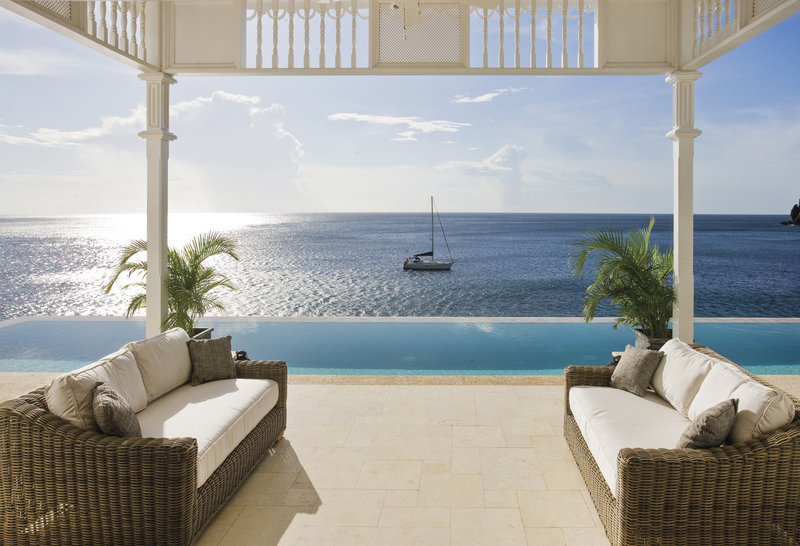 This lush villa is a three bedroom home is located in the Sugar Beach Resort, a luxury getaway that boasts elegance and opulence. By staying in one of the resorts residences you get to benefit from the resorts restaurants, bars, wellness options and close proximity to one of the island’s most stunning beaches - Sugar Beach. Entering the villa, you will notice an open-plan layout. The master bedroom, which has its own private terrace and a master bath complete with a clawfoot tub, will certainly be the most popular choice. 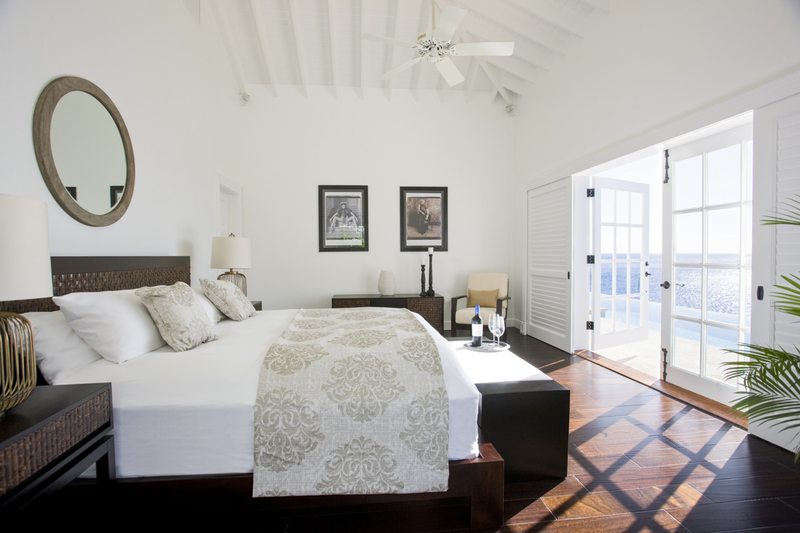 This room overlooks the Caribbean Sea, so you can bath in absolute style. The first of the two guest bedrooms also has an en-suite shower room and a queen bed. The third bedroom can be found just down the hall and has a queen-sized bed and an en-suite shower room. All of the bedrooms boast silky high-thread-count Egyptian cotton linens and romantic voile draping, so it’s right to suggest you might get the best night sleep of your life. Following on this luxury theme, all bathrooms are spacious with walk-in showers, magnified mirrors and blow dryers. Guests also have use of a full sized kitchen and should you wish to cook up a feast or simply prepare a morning cuppa, you have that option. There’s also a large living room that opens to a beautiful deck that leads out onto the infinity pool and, of course, a beautiful view. A large living room opening to a beautiful deck and infinity pool and the second guest room (with queen-sized bed and an en-suite shower room). 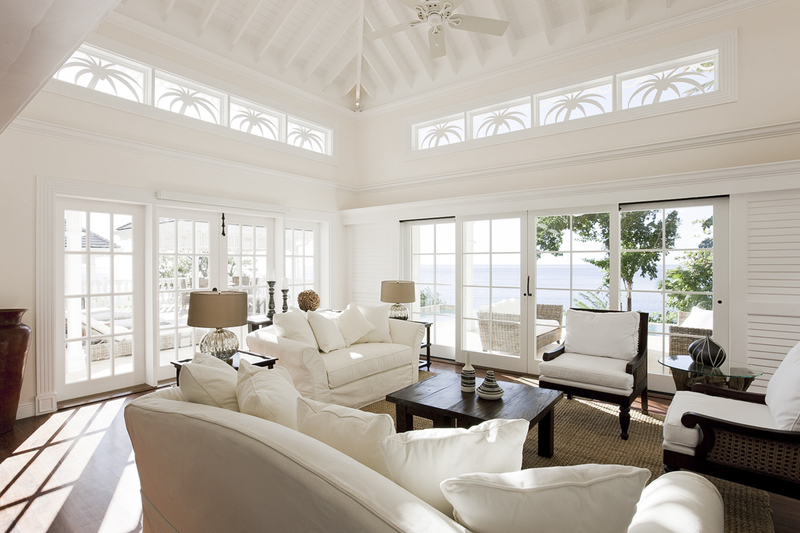 Furnished throughout with contemporary island decor, this is truly sophisticated tropical living. Choose Beach or Ocean View Villa residences. As with many great things in life, it’s the little things that make a real difference and nothing in this villa has been left unthought of. Enjoy full-sized ROIL and Natura Bisse bath amenities, while you roam around in your luxury bathrobes and slippers. 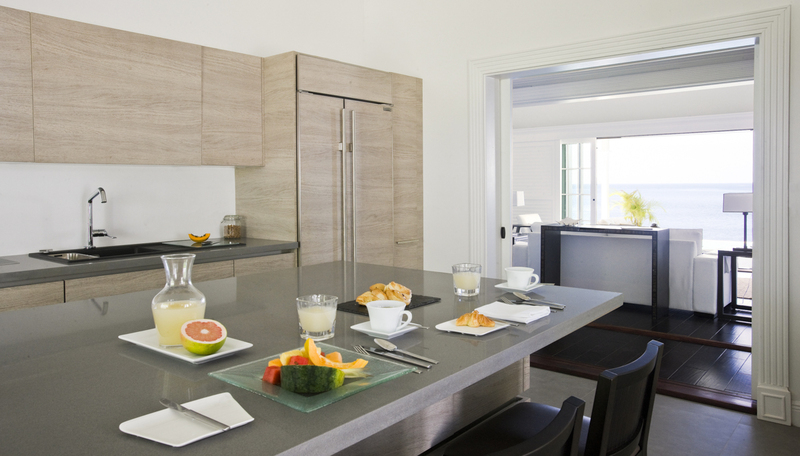 Make a coffee in the Nespresso coffee machine, while enjoying snacks from the mini bar. As if that wasn’t enough, each villa also has a personalised butler service and turndown service, life of luxury? Absolutely. Understandably, the outdoor area is equally as thought out and special. 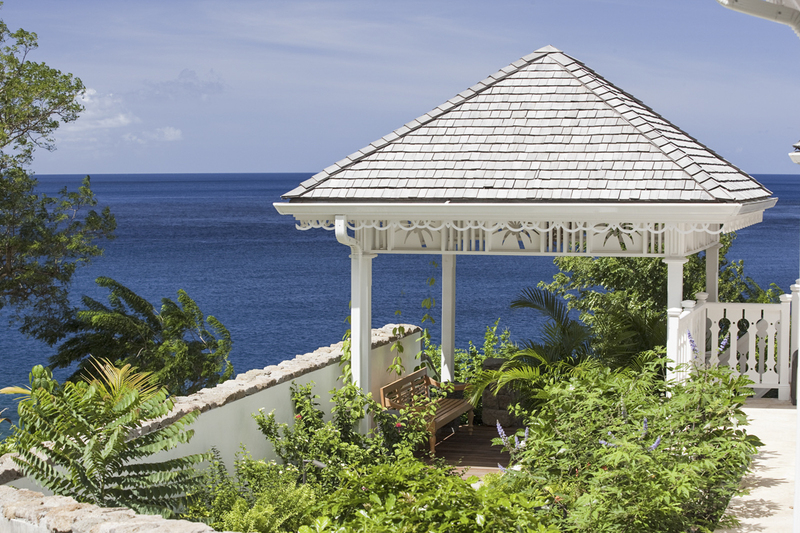 As you sit on the private balcony, by your private pool overlooking the breathtaking natural beauty of St Lucia, you’ll never want to leave. St Lucia is a dreamy getaway that offers divine sunsets, stunning beaches and plenty of untouched beauty. As soon as you land you will be overcome with the romantic and relaxing energy that St Lucia boasts, whether you’re looking for a relaxing retreat, a family-friendly fiesta or a action-packed trip there’s something for everyone. The breathtaking natural beauty has remained largely unspoilt, and it is a down-to-earth place even though it is dotted with countless small and luxurious resorts. Of course, the beaches are one of the biggest draw cards to The Caribbean as you sun yourself, take a dip to cool off and repeat. There are many stunning beaches in St Lucia, Reduit Beach is one of the most popular swim spots, Anse Cochon an unspoilt dark sand beach and of course, Anse des Pitons, the white sand beach frequented by visitors to Sugar Beach. There are actually few white sand beaches with most offering a mix of orange and striking black, with only a few rare exceptions. Foodies also flock to St Lucia to tempt their sweet tooths with a cocoa plantation tour, balanced out with some soul food in the form of Creole cuisine. 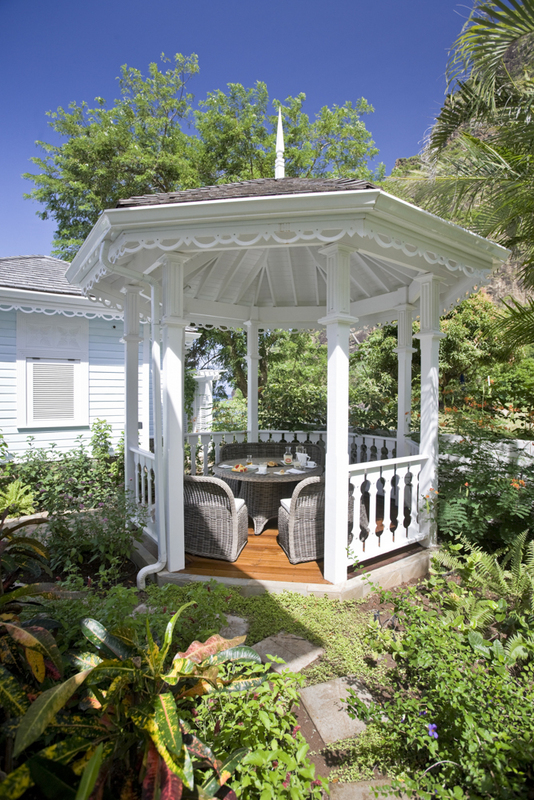 If you are a chocolate fan, Holetown Estate is well worth a visit as you can learn more about the chocolate making process - and give some a try, of course. The beaches are a must-see, however, there is more to St Lucia’s natural beauty than sand and crystal clear ocean. The island also boasts many lush, tropical landscapes worth exploring. Must-visits are the 19,000-acre National Rain Forest, the Diamond Botanical Gardens, Pigeon Island, and the Sault Falls. 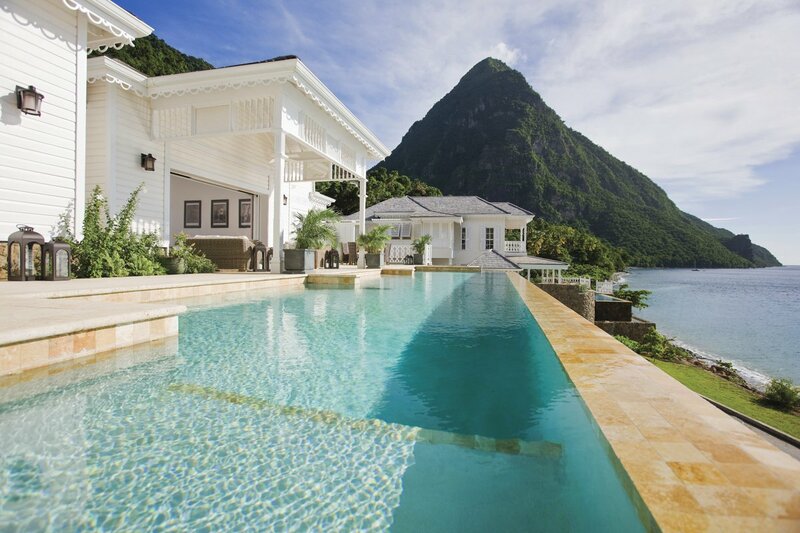 The villa itself is nestled in the luxury St Lucia resort and hotel, which is set within over 100 acres of lush rainforest on the site of a sugar plantation from the 18th century. This resort boasts elegance and luxury and you will be spoilt for choice, especially when it comes to food. There are three restaurant offerings on-site: The Great Room, which is perfect for discerning diners; The Terrace Restaurant, which is ideal for slightly more laid-back dining and Bayside Restaurant, which is perfect for enjoying Caribbean delicacies. 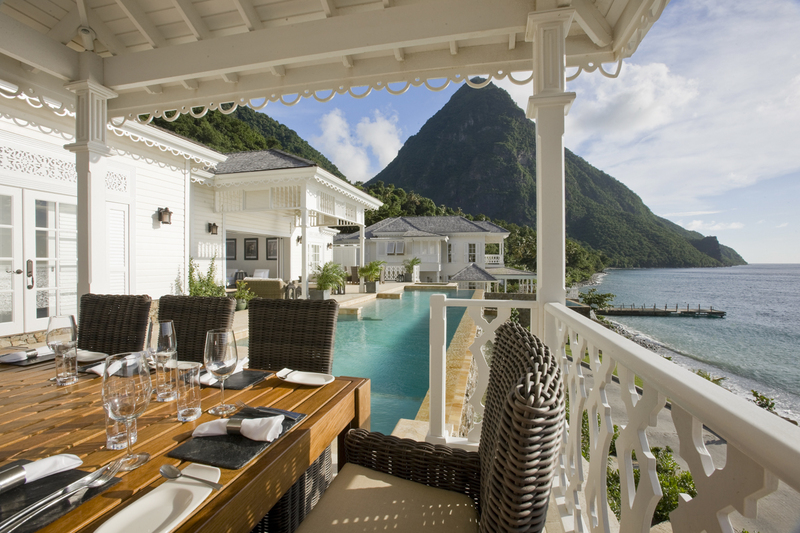 There are also three bars and lounges: Bayside Bar in St Lucia, Cane Bar and The Palm Court Bar and Lounge, so you can wander down from your villa for cocktail and fresh local specialties. Of course, there may be nights you don’t want to leave your villa, so you can order room service or you can take private dining to a new level with a beach service dinner for two. If you want to take a break from relaxing by the pool spend an hour or so at The Rainforest Spa, with specialty treatments sure to help you relax into your holiday like never before. You can also feel zen thanks to the yoga and pilates classes. There’s also complimentary watersports for those seeking something a little more exciting, from windsurfing and sailing to kayaking and Hobie Cats. As you wander around in a blissful daze, with a full belly and a relaxed soul, you can enjoy the lush grounds of the resort. These usher down to Sugar Beach, a Viceroy Resort, one of the rare white sand beaches that leads into the glistening Caribbean Sea and offer stunning views of the UNESCO World Heritage-listed Pitons at on your doorstep.